1. 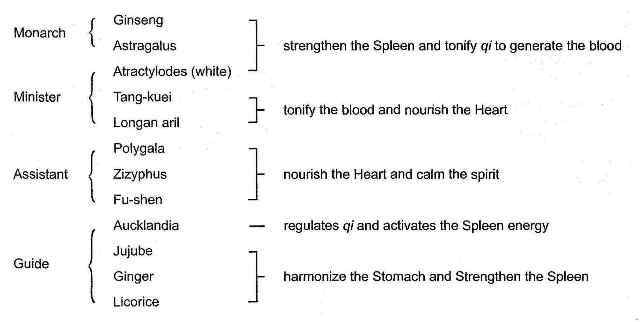 Deficiency of both the Heart and Spleen caused by deficiency of qi and the blood due to over-thinking and worries, marked by pale or sallow complexion, palpitation, poor memory, insomnia, night sweating, deficiency heat, reduced appetite, fatigue, lassitude, a pale tongue with thin white coating, and a thready and moderate pulse. 2. 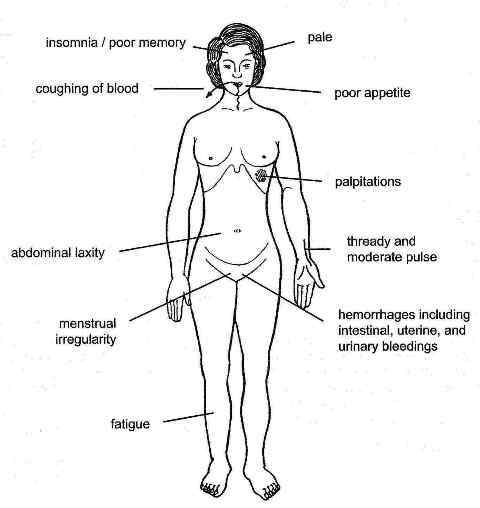 Failure of the Spleen to control the blood marked by metrorrhagia, metrostaxis, preceded menstruation, profuse menstrual bleeding with light color, prolong menstrual bleeding, and profuse leukorrhea. Modern: Anemia, insomnia, neurasthenia, coronary heart disease, arrhythmia, chronic liver disorders, functional uterine bleeding, menopausal syndrome, thrombocytopenic or allergic purpura, postconcussion symdrome, etc.